This allegorical painting depicts a genre scene: a view towards an open bay, greenery, and people busy with their daily errands. The landscape is painted from above, in aerial perspective, which helps the painter show a vast piece of the sea and a port in the distance. The composition is open, the painting is smooth, in emerald greens across the middle, light blue across the top, and brown hues with sharp red accents across the bottom. Subsequent zones of recession shift in intensity: a dark diagonal line of hues separates warm, green-and-brown hues of the land low and left from cold green-and-blue hues around the setting sun high and right. Soft colors, blended at places, render a calm atmosphere, which envelopes and swallows the eponymous dramatic event; interplay of light and shade builds emotions and shapes the reception of this work of art. The nearest land is in the left bottom third of the painting, it is a relatively small plot. Above it, spreading to the right three-quarters of the painting, is a wide wedge of emerald bay and shining sea, visible through the leaves of the nearby trees and under the bay’s distant shore. The bay merges with the sea; the sea continues to the right edge of the painting, underscoring the sun half-sunken into it. In the foreground – a plowman. Situated in the middle of the land plot, with his back towards the viewer, he walks obliquely away to the left with his gaze fixed to the ground. His black hair is cropped short and hangs under a greenish baggy hat; pointy clumps of sweaty locks cling to his neck and face during hard work; the skin on his neck is dark, as if soiled or tanned. He is dressed in a bright red shirt with long puffy sleeves and a loose greenish tunic which drapes from the rear of his waist in pleats; underneath, a light-colored apron covers his thighs over dark brown skin-tight hose; on his feet are green shoes. The colors, cut, and lay of the fabrics suggest finery incongruous with that expected on a practical field laborer. With shoulders hunched but back straight, the plowman guides a harnessed chestnut horse and wooden plow to overturn filleted strips of green grass into winding contours of smooth brown furrows [what to some might effect striking similarity to a zen sand garden, and to others, impetuous lines]. Halfway across their plowed plot, near the left edge of the painting, there grows a thin gnarly-top tree over twice the horse’s height, sparsely baring little leaves. Just beyond, another plowed plot in darkened shadows is traced by a wild hedge. The hedge travels from the tree’s base; then deeper to the right, where it joins two more clearly visible trees; then back left to merge into the plot’s far tree-line along a thick grove in distant perspective. It is at the base of the tree-line, at the furthest, darkest edge of the second plowed plot, that a hotly discussed, mysterious element of this painting occurs: a corpse in the shrubbery. While relatively small and easily overlooked, it is identified by some as the top of a balding man’s head and upturned face, the man lying on his back with his head at the field’s edge and his body extending away into the brush. The supposed head and face are distinctly lit in unmistakable contrast to the surrounding darkness. The semblance of a body is discerned from its deep reddish and purplish hues which ever-subtly differ from the deep greens of the surrounding foliage above and the dark browns of the ground below. In the right-of-middle foreground, a step lower toward the water from the plowman’s patch of land, there is an overgrazed steep outcropping, crowded with a sturdy-framed shepherd, his heeled dog, and a densely scattered herd of a couple dozen white sheep with two black sheep among them. The man’s face is turned skyward; its expression is indistinguishable beyond a possible squint. He stands surrounded by his animals, dressed in a blue shirt, with a pouch or a purse at his belt, green trousers with a discernible turgid-ness at the apex of his legs, and a brimmed hat tipped back and secured by a lanyard around his thick neck. His legs are crossed – just as are his arms which tuck across his chest; secure in their crook is a shepherd’s staff which he leans forward on. His attention turned up and out of frame; he does not see his sheep scattering toward the edge of a bushy cliff hanging over the water. 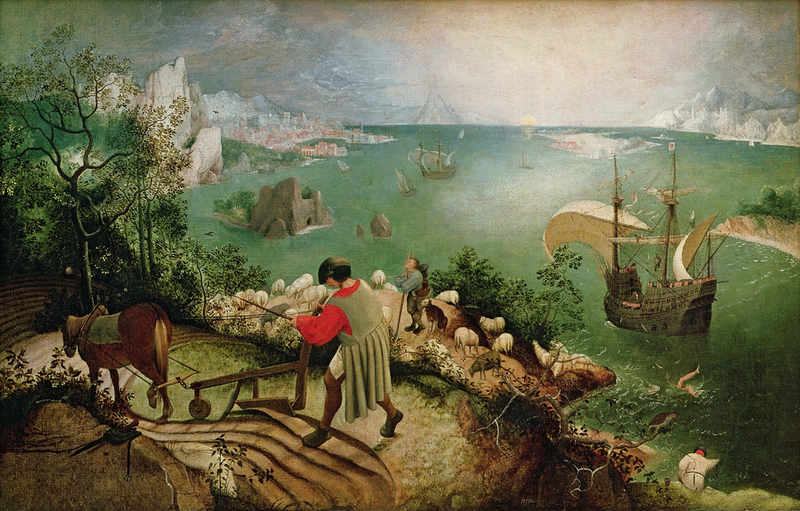 At the painting’s right bottom corner, visually right of the plowman and the shepherd, but effectively far below them, on a rock at the water’s edge, there sits a fisherman. Crouched or sitting on a rock ledge with his back to the viewer, he lunges forward and slightly right, with a fishing rod in his far outstretched right hand. His grip is choked-over-a-third-up the length of the pole. On the rock to his left there sits a pewter mug with a handle. The fisherman wears a white tunic girdled with a dark string, darker breeches underneath, and a tightly wrapped red scarf under his black hat. On a dry branch hanging off the cliff directly above his head there sits a dark green and brown partridge, as if surveying the fisherman. Following a visual line diagonally up and right – from the plowman’s plot, through the shepherd’s outcropping, above a cove occupying the painting’s lower right third – a sturdy and stout Spanish Galleon is seen sailing away toward the painting’s distant bay and port in the upper left. The chosen perspective relates the Galleon as similar in size to the plowman in the foreground. With two bulging, wind-filled sails and two neatly secured against their cross masts, its sailors climb the rope net to the crow’s nest or tend to other duties; readying for port. The painting’s mid-ground shows the bay’s waters to the left, and the open sea to the right and above a small triangle of land, which peeks from the right edge to define the far limit of the foreground cove. On the waters of the bay there is a jutting-rock stronghold with a cave, right of that sails two small sail boats and another Galleon – all vessels seem headed towards a red-bricked port further up the shoreline in the background, near the horizon line. Situated on the main land, past some protruding sheer-cliffs which tower along the bay’s far side, an eroded shoreline traces between a non-descript forest and a small boat. It transitions into a horseshoe port city on the horizon. The port is of dense, red, Spanish-tile roofed structures crammed onto the shallow foothills of a towering gray mountain backdrop. The top fourth of the painting is a green, blue-and-gray sky, lit with a lavender glow from the sun setting left of center. The sun’s golden half-circle sets atop the sea and reflects across ripples down a yellow tapered point, surrounded by tall white grey sharp peaks of mountain ranges in the far background horizon line to the right, their silhouettes fading into the pigeon grey sky. One can just make out whispered hints of seeming ice castle silhouettes. All elements of the painting are minimized to contrast them with the plowman in the dominating position; a position which commands emphasis by the bright redness of his shirt. Almost as if intentionally painted to be initially overlooked, between the fisherman and the galleon in the near-right cove, there drowns a person. One can only see their flailing naked legs and part of their right arm, helplessly churning up the water; on the surface float a few feathers. Evidently, there is no impending help for him. Fraught with meaning, the painting evokes a plethora of speculations. Some claim that the bloated, discarded body in the shrubbery is the image of the artist himself. Other suggest man’s inhumanity to man (proverb: “A man dies, and the world hardly blinks”); heading toward the Kingdom of God (a common expectation of the era’s peasants was to focus only on their job. See the proverb: “Leave the dead to bury the dead…”), or death in the midst of life (the top half of the canvas shows natural death and the bottom half shows the living who are attentive to their assigned tasks. See the proverb: “No plow stops for a dying man”). Further still, some students of the painting mention recent infrared reflectographical analysis suggesting that the figure may simply be a defecating man, an earthy vulgarism. Another theory links the fall of Icarus, the hidden body, an unpopular governor, Phillip II of Spain, and a suggested political statement related to war and the taxes levied to fund it.